Coming to the Embassy Theatre this week, Purple Zeppelin. Turkey Creek. 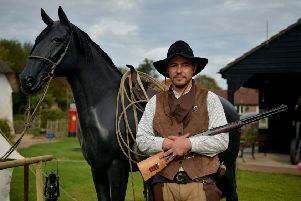 Wild West event at the Village Church Farm, Skegness. 10am to 4pm. The Tiger Who Came to Tea exhibition. Gunby Estate, Hall and Gardens. 11am-5pm. Get Funked, hosted by Magna Vitae, Grosvenor House Hotel, Skegness, 7pm. Painting classes with Fossey. Village Church Farm, Skegness. 11am-1pm. Glyn’s Art For Life, Methodist Hall, Algitha Road, Skegness. 9am-11.30am. To book a place, call 01754 228477 or 07941 024285. Learn to dance - ballroom or sequence, Latin American, jive, rock ‘n’ roll – County Hotel, Skegness. Weekly modern sequence dance at the Pensioners Hall, Skegness, 7.30-10pm. Little Gems Dance Group, Lillibet’s and Imperial Rooms, Grosvenor Hotel, Skegness, 5–7pm. Purple Zeppelin. The Embassy Theatre, Skegness. 7.30pm. £21.50 (£10 children). Fortnightly sewing and chat group. Alford Craft Market. 10.30am to 12.30pm. £2 per person to cover tea, coffee, and biscuits. No need to book. Learn to dance - ballroom or sequence, Latin American, jive, rock ‘n’ roll – County Hotel, Skegness. Palms Tai Chi Club, at Trusthorpe Village Hall, Fridays 10.30am to noon, £4. Quiz Night, Welcome Inn, Burgh Road, Skegness, 8pm. Bingo, Burgh Windmill Granary, 7pm. Keep fit class for over 50s, Burgh WI Hall, 11am to noon. Bird feeder making. Gunby Estate, Hall and Gardens. 11am-5pm. Spitfire Solo. Alford Corn Exchange. 8pm. £10. Palms Tai Chi Club, County Hotel, Skegness, 10-11.30am. £4. Learn to line dance, Burgh Methodist Church. Beginners’ class from 1.30-2.30pm, and an improvers’ class from 2.30-3.30pm. Call 01754 811505. First Step To Fitness. Spilsby Pavilion, Ancaster Avenue. 9am. £5. Contact Lisa at Lincolnshire Fitness on 07749 842092 for details. Active Ageing. Spilsby Pavilion, Ancaster Avenue. 10.15am. £5. Contact Lisa at Lincolnshire Fitness on 07749 842092 for details. Fortnightly knit, crochet and chat group. Alford Craft Market. 10.30am to 12.30pm. £2 per person. Includes tea, coffee and biscuits. No need to book. Wild art making. Gunby Estate, Hall and Gardens. 11am-3.30pm. Zumba Fitness with Michelle, Lillibet’s & Imperial Rooms, Grosvenor Hotel, Skegness, 7-8pm. 50+ Fitness, Burgh le Marsh WI Hall, Orby Road, 10.30am Tone-Fit, 11.45am Stretch-Fit, 1pm Dance-Fit. First Step to Fitness. Burgh le Marsh WI Hall, Orby Road. 6pm. £5. Contact Lisa at Lincolnshire Fitness on 07749 842092 for details. Stretch and Release. Burgh le Marsh WI Hall, Orby Road. 7.30pm. £5. Contact Lisa at Lincolnshire Fitness on 07749 842092 for details.